This is a photo heavy post - but I wanted to combing the little treat holders with this post rather than give them their own, since the colours all match and the card will be given with one of the treat holders for Valentine's Day. 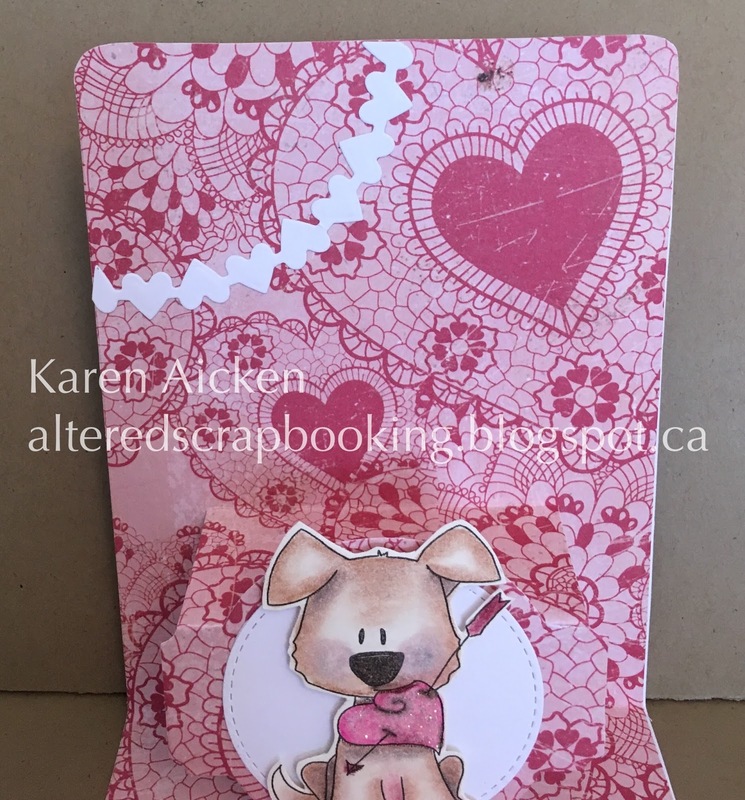 I had so much fun making this one ... in keeping with me trying to use older products in my studio, I pulled out this fun stamp set by Paper Smooches. After the lamb was stamped, die cut and coloured I decided to add the wiggly eyes. Ahahaha - they crack me up. It's hard to see in the photo, but the lamb's nose also has some shimmer from a Wink of Stella pen. ... and a look at the card fully opened. 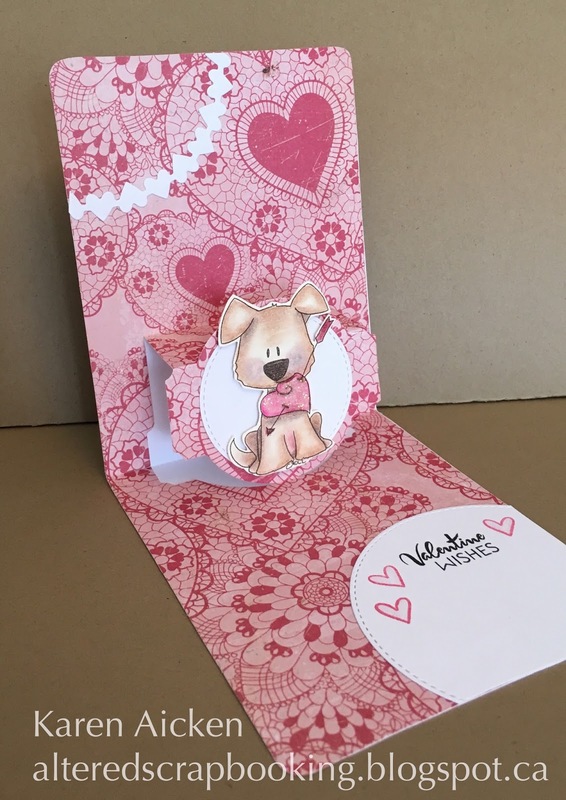 I used the Twist Circle Pop-Up by Karen Burniston - I don't think I have done an A2 card with it before but it worked out just fine. More older product ... the stamps and banner punch are staples in my studio even though I've had them for years. The lacy border is also an older die that I don't use nearly enough. Another older die is this Shaker Box by Sizzix. It's a BigZ die and I cut it from patterned paper then decorated it with a punched bow. The sweet paper clip and tag are both by Karen Burniston ... yes, cut from card stock. How fun is that paperclip? When you slide off the Belly Band, you can see that I added Swiss Chocolates inside. Yes, I could have wrapped them in coordinating paper but chose not to. That just makes them harder to open and eat, ha ha. Since it turned out so well, I decided to make a couple more ... the next two are identical. I used a ribbon tie instead of a belly band on these ones. The layered hearts are from the Heart Pivot by Karen Burniston, and the X0X0 is a fairly new die by Lawn Fawn. I knew I'd get a lot of use from it when I ordered it last Fall. I also added one of the Swirly Scribble circles - love that it gives your project just a little somethin' somethin'. These two have the XOXO across the transparency lined window. Finally, here is a look at the three Treat Boxes all together! Today's share is a Valentine card with a cute baby bear holding a heart banner. I had been having fun with Els' Fitted Frames and this card came together in no time. The bear is the baby bear image from the Stampin' Up set. Love that set and so happy I snagged it. I especially like that it came with dies! The heart banner was a leftover piece from my stash and it fit perfectly between his paws. Today's share is a Chinese New Year card I made for a fiend. While I won't always be able to make her one, this is the Year of the Rooster and since I had this awesome Rooster die anyhow - how could I not? I love love love the red and gold glitter paper. The number dies I've had for a long time and it's always fun when I can use them on a project. The inside has a shaped banner where I penned the words New Year first in black ink then I went over it with a gold gel pen. Card size - 5 x 7"
It's Saturday so that means a new challenge at the Crazy 4 Challenges Blog. Our January 2017 Hostess is Caz Counsell, and our guest designer is Lynn Anderson (Craft & Waffle). Here is Caz' challenge: Last week the 21st was Squirrel appreciation Day! Show your love for these furry critters, I you don’t have a squirrel use any one of your favourite furries. I love making Valentine cards ... and apparently I love making Easter cards too. I picked up a couple sheets of Easter patterned paper this week and I can't wait to cut into them. Ha! I do know these are watermarked with my old blog ... I can live with it. Eventually I'll have shown all the cards I'd made ahead of the challenges/seasons and won't have to put this disclaimer in. 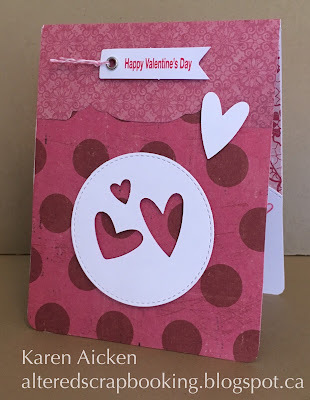 It's Flip-It Friday here on my blog, and I have a Valentine Flip-It card to share today. I found this fun kraft embellishment in my stash, and it had a clear embossed heart in the centre. I rubbed chalk onto the design and added some gold gel pen dots. The little heart is from Karen Burniston's Spiral Circle Pull Card - I love the shape of that heart. 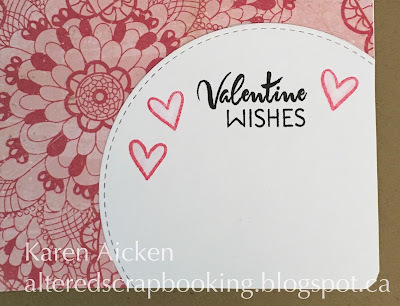 I added gold dots to the inside scalloped circle, as well as drawing some gold hearts around the stamped sentiment. It's Throwback Thursday here on my blog and I have an older Valentine to share with you. Older because I made it last Spring! I had just received my order with Els' Fitted Frames and this patterned paper was sitting on my stamping table. The card practically made itself! The stickers had been in my stash for many years - they were from a dollar store that is long gone. But they matched the patterned paper perfectly - I was so happy! Back when I finished the card I had already sent all the Valentines I needed to for 2016 - so this one went into the stash for 2017. Gotta love being a little ahead of the game. Today's share is a set of 5 Love Notes that I put in my Mom's Christmas Stocking. She likes to send her Great Grandkids a little note now and then, and they love getting Happy Mail. I trimmed the journal cards from a sheet in a DCWV paper stack, and added them to card blanks with patterned paper and a strip of card stock. You can see in the photo, that the journal cards have shiny embossed bits. The finished cards are blank inside and ready for her to write her note. I like to do A2 size for the Grandkids Love Notes as they are easy for them to manage and easy to stuff in a backpack or pail or whatever they are presently playing with. They like to keep their Love Notes with them for quite a while! Note, you can find my cards from July 2011 - December 2016 on Alteredscrapbooking.blogspot.ca . I had a bunch of cards made ahead, which are already water marked with alteredscrapbooking and I'm choosing not to re-do all those photos with a Painted Mountain Cards watermark. I have another Valentine card to share today. Not only did I pre-cut dozens of Christmas Pop 'n Cut card bases a couple of years ago, I cut some Valentine ones too. This is one of them. Inside is a Pop-up with a cute dog holding a heart. I love using the Ring Frame Edges by Karen Burniston as little banners, and the heart one seemed perfect for a Valentine. It also breaks up the business of the patterned paper a bit. Note, you can find my cards from July 2011 - December 2016 on Alteredscrapbooking.blogspot.ca I had a bunch of cards made ahead, which are already water marked with alteredscrapbooking and I'm choosing not to re-do all the photos. Today I have four cards to share made using bits from my stash. The layered chipboard embellishments had been sitting in my bin and it was time to get them onto cards. I decided to use them for simple Valentine's. I used a Sakura Stardust pen to outline the hearts printed on the jar. The card insides are pretty much identical, with strips of patterned paper that coordinates with each card front, a stamped and water coloured heart and a popped up stamped/die cut sentiment label. The next two cards also use chipboard embellishments, but also a doily or a 'swirly scribble' die cut. Below you can see where I added the sparkle pen to the open hearts printed on the jar. Back in the Fall, I finally ordered the Stampin' Up Swirly Scribbles dies. I love them! They are so fun to add just a little something to your cards. Here I used the largest one and cut it in half so it would show on either side of the chipboard block. The inside of the heart was outlined with the same sparkly pen, and the 'HUGS' was written with a black glaze pen for added dimension and shine. Yesterday's CHA show was fabulous - my head is reeling from all the eye candy and lovely people I got to meet. Some fun new products coming out that I can't wait to hit the shelves and of course it was a highlight to meet Karen Burniston face to face. To be able to attend a show like that with Karen B, and Kelly - and Sandy Diller as well - was just SO much fun. I loved every minute of it. Today I'd like to share another card that went into the package for my Dental Hygienist Anne. I've had these candle stamps/dies for a long time and only used them a couple of times. Since I'm trying to use some of my older products these days it seemed like a good time to pull out the candle set. Anne really appreciates receiving the Birthday cards, as she says Birthday cards are the only ones she sends out. I had to have some surprise dental work done over the Christmas holidays, but instead of bringing her hand made Birthday cards, I brought her a package of my Christmas gift tags. On a personal note - today is a VERY exciting day for me. CHA is in Phoenix this weekend and I get to go for the day. OMGoodness, I am over the moon. Not only do I get my first CHA experience, I get to do it with my friends Kelly Booth AND Karen Burniston. Karen B and I have never actually met face to face so today is going to be an amazing day. Amazing. Now don't fall over or anything, but I did stay REALLY close to the sketch! So not like me. :-) I used one of Karen Burniston's Agatha Edges to create the shaped split in the background paper. Such a fun idea - I know there are dies out there that are made specifically for this purpose, but using an edge or border die you might already have works too! Thank you Caz, for this fun idea. Time to start working on Valentine's, so I added some hand lettering inside. Still need to work on spacing and keeping my letters from angling up to the right, but practice will get me there eventually. Check out the C4C blog to see how the Crazies have been inspired by the challenge. We'd love to see your take on it, so be sure to stop by the Crazy 4 Challenges blog and link up your creations. 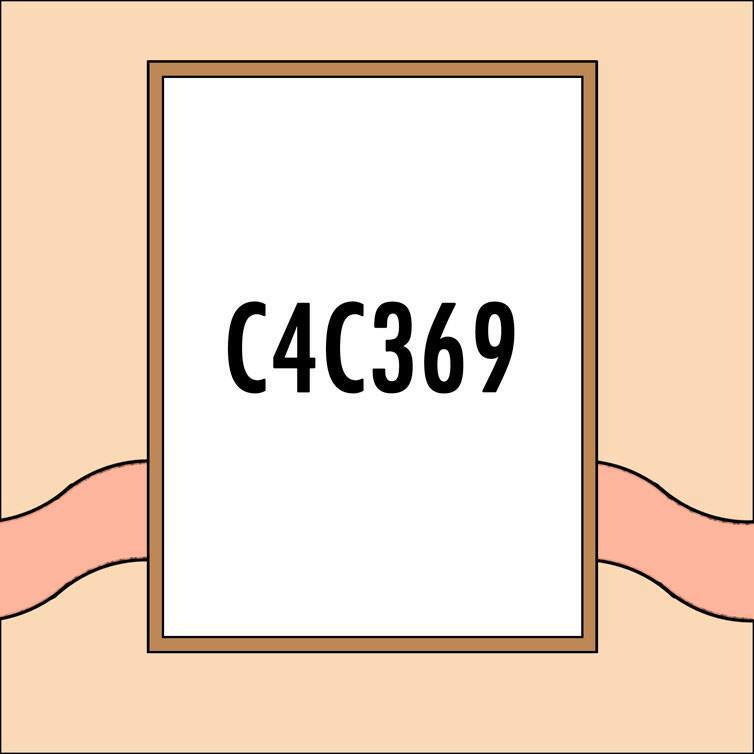 If you are uploading to an online gallery, please use the keyword C4C369. My brother has a December birthday, and this year he asked if we would mind giving him money for his birthday instead of a gift. He had something in mind that he was going to pool our gifts for so we were all on board. Obviously, I had a hand made birthday card for him but I also wanted to give him a special money holder. This is what I came up with, and since I had all the supplies out I decided to make a spare one to keep on hand. They stay closed with a little magnet. This is my first time using the magnets and I'm sold! Karen Burniston uses them on bulky cards and now that I know how well they work, I'll be using them more. However, next time I will adhere them between the card layers so they are hidden. Not only was my brother happy with his gift, he was impressed with the magnetic closure. Ha! 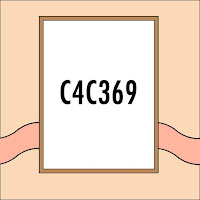 size - 7 x 3-1/2"
When you pull the tab, the heart & frame pulls up and stands for display - AND reveals a stamped message. I make these cards flat, post card style cards but I still add a little decoration to the back side. I was working ahead, so have a bunch of cards to post here with my Altered Scrapbooking watermark instead of Painted Mountain Cards. I'm choosing not to re-do all those photos.